Most biographers would agree that it is difficult to write about someone whose face you have never seen. 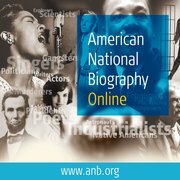 When I set out to write a biographical entry on Thomas Smith Grimké (1786-1834) for the American National Biography Online, I confronted that challenge. Then I learned that the editors at ANB wanted an image too. Now I had two reasons to find one. Thomas Smith Grimké was certainly wealthy enough, and for that matter prominent enough, to have a portrait done. The son of a South Carolina state judge and the brother of Charleston’s famous abolitionists Sarah and Angelina Grimké, Thomas was an accomplished lawyer, state legislator, orator, and reformer. In his speeches (which he frequently arranged to have printed as pamphlets and sent to prominent citizens and libraries around the country), he advocated for educational innovation, temperance, and peace. He also led the Unionist side in South Carolina’s intense debate over the state’s right to nullify a federal law (foreshadowing the Civil War to come) and corresponded with James Madison on the history of the Constitutional Convention. Though a Southerner, he was most famous in the North, and, though a slaveowner, he might have—or so his sisters later believed—become an abolitionist if he had not died of cholera at the age of 48, while in Ohio on a lecture tour. 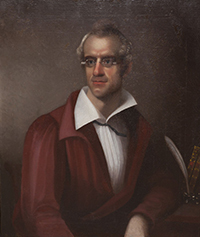 Thomas Smith Grimke portrait in Miami University Art Museum’s collection. Used with permission. Though it was possible that the only portrait of Thomas might be in private hands and therefore difficult to locate, I hoped I would come across a publicly accessible image while doing research for the entry. And I did. In 1924, a historian who specialized in Ohio history published an essay about Grimké in The Ohio Archaeological and Historical Quarterly. Underneath a picture of Thomas were the words, “From a photograph of a painting in the Library of Miami University.” Bingo! And it made sense. I already knew that Grimké, while on his lecture tour, had given a speech to a student literary society at Miami University of Ohio. According to the 1924 essay, the painting had been commissioned by the society to commemorate his inspiring visit. Learning that the painting was now at the university’s art museum, I spoke with the director, Dr. Robert Wicks, who said he would be happy to show it to me. Luckily, I was already planning to drive from Chicago, where I live, to Charleston, South Carolina to do research on the biography I am writing about the Grimké sisters. I decided to swing by Miami University on my way home. Thus I found myself one day in October 2014 standing with Dr. Wicks in front of a large and fascinating portrait of Thomas Smith Grimké. The first thing I noticed was that this was not the traditional image of a forceful, successful man. Grimké had a kind face. In capturing this, the artist had done well. I had read enough obituaries by then to know that Grimké was much beloved for his gentle spirit. Now I could see it. Etching by Doolittle and Munson. 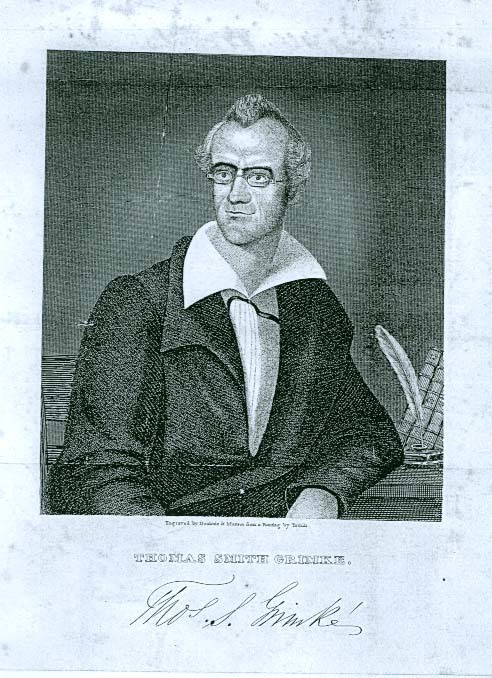 Copy from the Indiana Historical Society collection, public domain. I also noticed that his collar and his cravat were askew, as if he was too distracted to pay much attention to his appearance. Fascinatingly enough, this too fit with what I had read in the obituaries. Though a very wealthy man, he was famous in Charleston for walking down the street looking quite disheveled. Just as I had hoped, the picture brought the man to life for me and hopefully it would do the same for readers. But who was the artist? Dr. Wicks told me this was a mystery since the painting was unsigned front and back. We then looked in the painting’s “object file” to see if I could learn more about when the portrait was painted and, to our surprised delight, found a $25 receipt signed by the artist, Abraham G. D. Tuthill, an itinerant painter. The receipt, it turned out, had found its way into the file in the 1980s, long after the museum had concluded the artist was unknown. The official records had just not been undated. A few weeks later I located in the general print collections of the Indiana Historical Society an etching of Grimké based on the same painting. But here is what is interesting. While the painting shows Grimké as a tender soul, the etching does not. Doolittle and Munson, early Cincinnati engravers, had enhanced the squareness of his jaw and given his mouth a new firmness. They also straightened his collar a little. Thus does culture insist on tidying up the truth to conform to its own expectations! So I am very glad I have an image of the painting itself, and that Abraham G. D. Tuthill was a good enough artist to accurately capture the character of Thomas Smith Grimké. And I am especially glad to share the fruits of my search with the readers of the ANB. Image Credit: View along the East Battery, Charleston. By Samuel Barnard, 1831. Public domain, Yale University Art Gallery. Louise W. Knight is a biographer and historian. Her publications include Citizen: Jane Addams and the Struggle for Democracy (2005) and Jane Addams: Spirit in Action (2010). She is a Visiting Scholar with the Gender and Sexuality Studies Program at Northwestern University. A very much overlooked person and element of American and Southern culture. The brother of the more famous sisters, his too early death cost South Carolina a voice that might have helped avert the 1861 disaster.